Kalpitiya is a peninsular, situated in the Puttalam District in the North Western Province of Sri-Lanka. There are an estimated 8000 families living in the Kalpitiya Division who where displaced as result of Sri Lanka’s civil war in 1990. As is usual in such areas with high numbers of internally displaced persons, high levels of poverty impact greatly on children, resulting in high malnutrition rates, low birth rates, low educational attainment and high rates of infectious diseases. Very poor infrastructure in addition to the close co-existence of many different ethnic/religious communities, all exacerbate the problems faced by the residents. Shining Life Children’s Trust engaged in a 3-year project with a local non- governmental organisation, Humanitarian Brotherhood Foundation (HBF) in Kalpitiya. 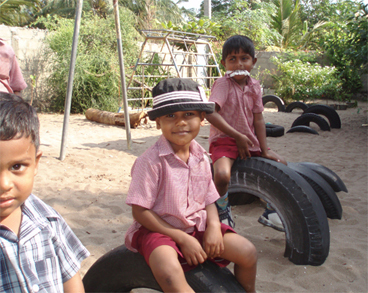 HBF works on social development programs in the Kalpitiya region, with all staff living locally. The project covers the villages of Ammathotam, Musalpiddy and Wannimundal, which include Christian, Muslim, Buddhist and Hindu communities, of Sinhalese and Tamil descent; these villages were selected according to need, after extensive research. Project objectives and activities have been designed through highly participatory means with an emphasis on community planning, to ensure that the project is both empowering as well as successful. The aim of the project is to improve educational opportunities and childhood care within these communities, whilst also ensuring families are better equipped to provide a better living environment for themselves. A local full-time project officer has been employed, who is responsible for the day to day running and monitoring of the project. Shining Life’s role is to provide funds for the project, technical assistance, management and monitoring of the project, and the project emphasises training by community members themselves. Selected community members participate in a programme to ensure that they can fulfil this role competently. All communities during planning highlighted the crucial need for awareness raising in key areas, such as the importance of education and early childhood care and development. Providing this in itself constitutes an element of‘outreach’. Further to this, health and educational programmes covering topics as diverse as diseases dangerous to reproductive health have been scheduled, following consultation with each community. Mothers and Children have, thus far, had very little common platform for common activities, knowledge sharing and discussion. Mothers’ societies have been formed to allow for discussion of problems, to aid educational programmes directed at mothers, as well as to facilitate the savings and credit programme. Children’s clubs allow the community’s youth to engage in sports and other activities, as well as to take part in workshops to discuss common problems. Both types of societies played an integral role in the planning of the project, and wherever possible attempt to unite members of different ethnic groups and religions into a common forum. Each village preschool has been/will be receiving new equipment, vital repairs, high quality play areas, toilet facilities and, in some circumstances, extensions. In the village of Wannimundal, a new preschool is being constructed to meet the needs of the Sinhala speaking minority. Each preschool employs two teachers, who have been receiving regular, high quality preschool teacher training through the Shining Life project. These teachers have also become accustomed to meeting on a monthly basis to share and discuss common issues – a vital plank of both empowerment and sustainability. Children of all ages in project areas will take part in various educational trips – an opportunity that most have never enjoyed before. Sustainability will partly be achieved via credit and savings schemes, the rules for which are determined by Mothers’ societies. These will form the basis for sustainable income generation in the long term, as well as provide for an instant insurance mechanism which is currently not present. Currently, banking facilities are limited in Kalpitiya. The HBCD (Home Based Early Childhood Care and Development) training programme should provide a good grounding in the optimisation of the home and immediate environment as a primary source of learning for children of preschool age. HBCD is based on the premise that children start learning from birth with the use of their five senses. Regular progress review meetings are facilitated by the Project Officer and emphasis is placed upon full participation of different beneficiary groups, including children. Such participation contributes to the sustainability of the project and aids the process of empowerment of all stakeholders.